A screenshot of the Hatch homepage, courtesy of US Navy. ARLINGTON, Va. – The Navy will launch its new crowdsourcing platform today, with the hopes of not only conducting Navy-wide searches for good ideas but also helping smaller commands generate solutions to their specific problems. 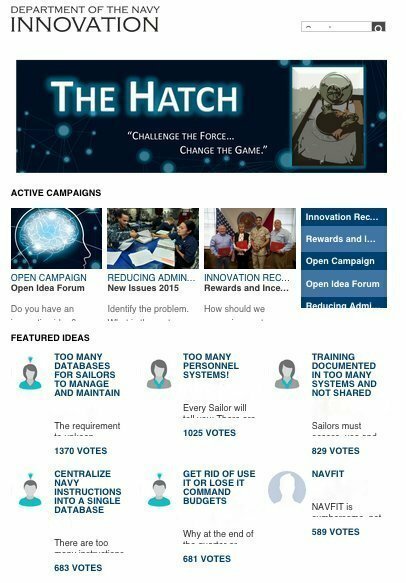 The Department of the Navy Innovation Hatch is a virtual forum in which users can pitch ideas and discuss and vote on others’ ideas. The first topic the Navy’s Office of Strategy and Innovation hopes to tackle is how to incentivize sailors to participate in crowdsourcing challenges, office director Maura Sullivan told USNI News in a May 14 interview at the Pentagon. Once those incentives are better understood, Sullivan said she hopes the Navy can prove – both through the incentives and through quickly acting on some easy-to-implement ideas – it is serious about listening to the Hatch users’ suggestions. “We want to allow ideas to move from the deck plate up to the Pentagon, but we also want to allow other commands, [commanding officers], whoever needs to be able to use this type of approach to solve a problem they have, access to the toolset that we’ve got,” she said. Sullivan said the advantage of using a crowd instead of experts to address Navy problems is that the crowd can refine ideas as a variety of perspectives weigh in, vote on ideas to identify the most popular and eventually identify consistently constructive users – much like eBay has user ratings to identify reliable sellers – who emerge as leaders in the virtual community. “I would like our office to make connections, to provide information and to provide what’s needed, but not to be the judge and jury” for the ideas that are submitted, Sullivan said. She said the decentralized model will need some intervening from her office – to ensure classified material and inappropriate comments stay out of the conversations – but overall she hopes that communities will develop around different topics, identify what resources they need and advocate at whatever level is appropriate. Sullivan said the funding model for the ideas generated by the Hatch is still being finalized, but she said she expects it to be a hybrid approach. Some ideas would be sent to the Navy budgeters directly for incorporation into the Program Objective Memorandum (POM). The Office of Strategy and Innovation would also get a pot of money – Sullivan said she hoped for about $10 million – to dole out as needed for ideas that would have a good return on investment. The Hatch will require users to provide a Navy email address and other credentials when signing up, but after users create their accounts they can access Hatch on their phones and tablets online or through a Hatch application.